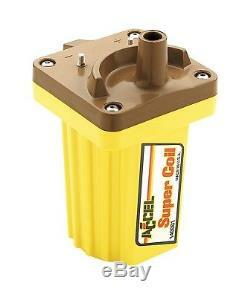 Ignition Coil-Super Coil ACCEL 140001. Specialized high temperature epoxy resists shock and vibration, while increasing thermal conductivity. These are direct plug replacements for OEM coils. They feature bodies and, or secondary towers molded in ACCEL yellow and feature brass secondary contacts (except direct fire coil on plug applications). L4 GAS OHV Naturally Aspirated, 1.2L 1166CC l4 GAS Naturally Aspirated, 1.2L 1166CC l4 GAS OHV Naturally Aspirated, 1.2L 1171CC 72Cu. L4 GAS OHV Naturally Aspirated, 1.2L 1198CC 73Cu. L4 GAS Naturally Aspirated, 1.2L 1198CC 73Cu. L4 GAS OHV Naturally Aspirated, 1.2L 1237CC 75Cu. L4 GAS SOHC Naturally Aspirated, 1.2L 1237CC l4 GAS Naturally Aspirated, 1.2L 1237CC l4 GAS SOHC Naturally Aspirated, 1.2L 1238CC 76Cu. L4 GAS SOHC Naturally Aspirated, 1.3L 1272CC l4 GAS SOHC Naturally Aspirated, 1.3L 1288CC 79Cu. L4 GAS OHV Naturally Aspirated, 1.3L 1288CC l4 GAS Naturally Aspirated, 1.3L 1290CC l4 GAS OHV Naturally Aspirated, 1.3L 1295CC l4 GAS SOHC Naturally Aspirated, 1.3L 1299CC 79Cu. L4 GAS Naturally Aspirated, 1.3L 1299CC 79Cu. L4 GAS OHV Naturally Aspirated, 1.3L 1308CC R2 GAS Turbocharged, 1.3L 1325CC 81Cu. L4 GAS SOHC Naturally Aspirated, 1.3L 1335CC l4 GAS SOHC Naturally Aspirated, 1.3L 1340CC 82Cu. L4 GAS OHV Naturally Aspirated, 1.4L 1393CC 85Cu. L4 GAS OHV Naturally Aspirated, 1.4L 1410CC l4 GAS Naturally Aspirated, 1.4L 1410CC l4 GAS SOHC Naturally Aspirated, 1.4L 1415CC l4 GAS SOHC Naturally Aspirated, 1.5L 1452CC l4 GAS SOHC Naturally Aspirated, 1.5L 1468CC 90Cu. L4 GAS SOHC Naturally Aspirated, 1.5L 1468CC l4 GAS SOHC Naturally Aspirated, 1.5L 1471CC l4 GAS SOHC Naturally Aspirated, 1.5L 1487CC l4 GAS SOHC Naturally Aspirated, 1.5L 1488CC l4 GAS SOHC Turbocharged, 1.5L 1490CC l4 GAS SOHC Naturally Aspirated, 1.5L 1498CC 91Cu. L4 GAS OHV Naturally Aspirated, 1.5L 1498CC 92Cu. L4 GAS OHV Naturally Aspirated, 1.6L 1588CC 98Cu. L4 GAS DOHC Naturally Aspirated, 1.6L 1588CC 98Cu. L4 GAS SOHC Naturally Aspirated, 1.6L 1588CC l4 GAS Naturally Aspirated, 1.6L 1588CC l4 GAS OHV Naturally Aspirated, 1.6L 1590CC 97Cu. L4 GAS SOHC Naturally Aspirated, 1.6L 1595CC 97Cu. L4 GAS SOHC Naturally Aspirated, 1.6L 1595CC H4 GAS OHV Naturally Aspirated, 1.6L 1595CC l4 GAS Naturally Aspirated, 1.6L 1597CC 98Cu. L4 GAS DOHC Naturally Aspirated, 1.6L 1597CC 98Cu. L4 GAS DOHC Turbocharged, 1.6L 1597CC 98Cu. L4 GAS Naturally Aspirated, 1.6L 1597CC 98Cu. L4 GAS SOHC Naturally Aspirated, 1.6L 1597CC 98Cu. L4 GAS SOHC Turbocharged, 1.6L 1597CC l4 GAS DOHC Naturally Aspirated, 1.6L 1597CC l4 GAS SOHC Naturally Aspirated, 1.6L 1598CC 98Cu. L4 GAS Naturally Aspirated, 1.6L 1598CC 98Cu. L4 GAS SOHC Naturally Aspirated, 1.6L 1598CC l4 GAS SOHC Naturally Aspirated, 1.6L 1599CC 98Cu. L4 GAS OHV Naturally Aspirated, 1.6L 1599CC l4 GAS SOHC Naturally Aspirated, 1.7L 105Cu. L4 GAS SOHC Naturally Aspirated, 1.8L 110Cu. L4 GAS Naturally Aspirated, 1.8L 110Cu. L4 GAS SOHC Naturally Aspirated, 1.8L 111Cu. L4 GAS Naturally Aspirated, 1.8L 111Cu. L4 GAS SOHC Naturally Aspirated, 1.8L 1751CC l4 GAS SOHC Naturally Aspirated, 1.8L 1770CC 108Cu. L4 GAS SOHC Naturally Aspirated, 1.8L 1770CC l4 GAS Naturally Aspirated, 1.8L 1770CC l4 GAS OHV Naturally Aspirated, 1.8L 1781CC H4 GAS OHV Naturally Aspirated, 1.8L 1781CC H4 GAS OHV Turbocharged, 1.8L 1781CC H4 GAS SOHC Naturally Aspirated, 1.8L 1781CC H4 GAS SOHC Turbocharged, 1.8L 1795CC l4 GAS SOHC Naturally Aspirated, 1.8L 1795CC l4 GAS SOHC Turbocharged, 1.8L 1796CC 110Cu. L4 GAS SOHC Naturally Aspirated, 1.8L 1798CC l4 GAS OHV Naturally Aspirated, 1.8L 1816CC l4 GAS SOHC Naturally Aspirated, 1.8L 1817CC 111Cu. L4 GAS SOHC Naturally Aspirated, 1.8L 1817CC l4 DIESE L SOHC Naturally Aspirated, 1.8L 1817CC l4 GAS SOHC Naturally Aspirated, 1.8L 1829CC l4 GAS SOHC Naturally Aspirated, 1.9L 119Cu. L4 GAS Naturally Aspirated, 2.0L 1989CC 122Cu. L4 GAS SOHC Naturally Aspirated, 2.0L 1993CC 122Cu. L4 GAS SOHC Naturally Aspirated, 2.0L 1994CC l4 GAS SOHC Turbocharged, 2.0L 1995CC 122Cu. L4 GAS Naturally Aspirated, 2.0L 1995CC 122Cu. L4 GAS SOHC Naturally Aspirated, 2.0L 1997CC 122Cu. L4 GAS SOHC Naturally Aspirated, 2.0L 1998CC 122Cu. L4 GAS SOHC Turbocharged, 2.1L 2119CC l4 GAS DOHC Naturally Aspirated, 2.2L 133Cu. L4 GAS SOHC Naturally Aspirated, 2.2L 133Cu. L4 GAS SOHC Turbocharged, 2.2L 134Cu. L4 GAS Naturally Aspirated, 2.2L 135Cu. L4 GAS SOHC Naturally Aspirated, 2.2L 2184CC l4 GAS SOHC Naturally Aspirated, 2.2L 2184CC l4 GAS SOHC Turbocharged, 2.2L 2187CC l4 GAS SOHC Naturally Aspirated, 2.2L 2189CC l4 GAS SOHC Naturally Aspirated, 2.2L 2197CC 134Cu. L4 GAS F-HEAD Naturally Aspirated, 2.2L 2197CC 134Cu. L4 GAS L-HEAD Naturally Aspirated, 2.3L 140Cu. H6 GAS Naturally Aspirated, 2.3L 140Cu. L4 GAS Naturally Aspirated, 2.3L 140Cu. L4 GAS OHV Naturally Aspirated, 2.3L 140Cu. L4 GAS SOHC Naturally Aspirated, 2.3L 140Cu. L4 GAS SOHC Turbocharged, 2.3L 140Cu. L4 LPG SOHC Naturally Aspirated, 2.3L 2253CC 138Cu. L6 GAS SOHC Naturally Aspirated, 2.3L 2253CC l6 GAS Naturally Aspirated, 2.3L 2254CC l4 GAS SOHC Naturally Aspirated, 2.3L 2294CC 140Cu. H6 GAS OHV Naturally Aspirated, 2.3L 2294CC 140Cu. L4 GAS SOHC Naturally Aspirated, 2.3L 2295CC 140Cu. L4 GAS SOHC Naturally Aspirated, 2.3L 2302CC 140Cu. L4 GAS SOHC Naturally Aspirated, 2.3L 2316CC l4 GAS SOHC Naturally Aspirated, 2.4L 144Cu. L6 GAS Naturally Aspirated, 2.4L 145Cu. H6 GAS Naturally Aspirated, 2.4L 145Cu. H6 GAS Turbocharged, 2.4L 2351CC l4 GAS SOHC Naturally Aspirated, 2.4L 2360CC 144Cu. L6 GAS OHV Naturally Aspirated, 2.4L 2366CC l4 GAS SOHC Naturally Aspirated, 2.4L 2366CC l4 GAS SOHC Turbocharged, 2.4L 2377CC 145Cu. H6 GAS OHV Naturally Aspirated, 2.4L 2377CC 145Cu. H6 GAS OHV Turbocharged, 2.4L 2393CC l6 GAS SOHC Naturally Aspirated, 2.5L 150Cu. L4 GAS OHV Naturally Aspirated, 2.5L 151Cu. L4 GAS OHV Naturally Aspirated, 2.5L 152Cu. L4 GAS Naturally Aspirated, 2.5L 153Cu. L4 GAS Naturally Aspirated, 2.5L 2491CC 152Cu. L4 GAS OHV Naturally Aspirated, 2.5L 2491CC 152Cu. L4 GAS OHV Turbocharged, 2.5L 2507CC 153Cu. L4 GAS OHV Naturally Aspirated, 2.6L 2551CC 156Cu. V6 GAS OHV Naturally Aspirated, 2.6L 2553CC 156Cu. L6 GAS OHV Naturally Aspirated, 2.6L 2555CC 156Cu. L4 GAS Naturally Aspirated, 2.6L 2555CC 156Cu. L4 GAS SOHC Naturally Aspirated, 2.6L 2555CC 156Cu. L4 GAS SOHC Turbocharged, 2.6L 2555CC l4 GAS SOHC Naturally Aspirated, 2.6L 2563CC 156Cu. L6 GAS SOHC Naturally Aspirated, 2.6L 2563CC l6 GAS Naturally Aspirated, 2.6L 2563CC l6 GAS SOHC Naturally Aspirated, 2.6L 2565CC 156Cu. L6 GAS SOHC Naturally Aspirated, 2.6L 2565CC 157Cu. L6 GAS SOHC Naturally Aspirated, 2.6L 2565CC l6 GAS Naturally Aspirated, 2.6L 2606CC l4 GAS SOHC Naturally Aspirated, 2.7L 164Cu. H6 GAS Naturally Aspirated, 2.7L 164Cu. H6 GAS Turbocharged, 2.7L 2672CC H6 GAS SOHC Naturally Aspirated, 2.7L 2684CC 164Cu. H6 GAS OHV Naturally Aspirated, 2.7L 2684CC 164Cu. H6 GAS OHV Turbocharged, 2.8L 170Cu. L6 GAS Naturally Aspirated, 2.8L 171Cu. V6 GAS Naturally Aspirated, 2.8L 171Cu. V6 GAS OHV Naturally Aspirated, 2.8L 2753CC l6 GAS SOHC Naturally Aspirated, 2.8L 2754CC l6 GAS DOHC Naturally Aspirated, 2.8L 2759CC l6 GAS SOHC Naturally Aspirated, 2.8L 2786CC 170Cu. L6 GAS OHV Naturally Aspirated, 2.8L 2792CC 171Cu. V6 GAS OHV Naturally Aspirated, 2.8L 2803CC 171Cu. V6 GAS OHV Naturally Aspirated, 3.0L 2959CC V6 GAS SOHC Naturally Aspirated, 3.2L 194Cu. L6 GAS Naturally Aspirated, 3.2L 196Cu. L4 GAS Naturally Aspirated, 3.2L 196Cu. L4 GAS OHV Naturally Aspirated, 3.2L 198Cu. L6 GAS Naturally Aspirated, 3.2L 3180CC 194Cu. L6 GAS OHV Naturally Aspirated, 3.2L 3203CC 196Cu. L4 GAS OHV Naturally Aspirated, 3.2L 3206CC 196Cu. L6 GAS L-HEAD Naturally Aspirated, 3.2L 3206CC 196Cu. L6 GAS OHV Naturally Aspirated, 3.2L 3212CC 196Cu. L4 GAS OHV Naturally Aspirated, 3.2L 3245CC 198Cu. V6 GAS OHV Naturally Aspirated, 3.2L 3254CC 198Cu. L6 GAS OHV Naturally Aspirated, 3.3L 199Cu. L6 GAS Naturally Aspirated, 3.3L 200Cu. L6 GAS OHV Naturally Aspirated, 3.3L 3261CC 199Cu. L6 GAS OHV Naturally Aspirated, 3.3L 3277CC 200Cu. L6 GAS OHV Naturally Aspirated, 3.3L 3278CC 200Cu. L6 GAS OHV Naturally Aspirated, 3.5L 215Cu. V8 GAS Naturally Aspirated, 3.5L 3524CC 215Cu. L6 GAS OHV Naturally Aspirated, 3.5L 3528CC 215Cu. V8 GAS OHV Naturally Aspirated, 3.5L 3528CC 215Cu. V8 GAS OHV Turbocharged, 3.5L 3528CC V8 GAS OHV Naturally Aspirated, 3.6L 220Cu. L6 GAS Naturally Aspirated, 3.6L 221Cu. V8 GAS Naturally Aspirated, 3.6L 3622CC 221Cu. V8 GAS OHV Naturally Aspirated, 3.6L 3655CC 223Cu. L6 GAS OHV Naturally Aspirated, 3.7L 223Cu. L6 GAS Naturally Aspirated, 3.7L 225Cu. V6 GAS Naturally Aspirated, 3.7L 3687CC 225Cu. L6 GAS Naturally Aspirated, 3.7L 3687CC 225Cu. L6 GAS OHV Naturally Aspirated, 3.7L 3687CC 225Cu. V6 GAS OHV Naturally Aspirated, 3.7L 3704CC 226Cu. L6 GAS L-HEAD Naturally Aspirated, 3.8L 230Cu. L6 GAS Naturally Aspirated, 3.8L 232Cu. L6 GAS OHV Naturally Aspirated, 3.8L 232Cu. V6 GAS OHV Naturally Aspirated, 3.8L 3769CC 230Cu. L6 GAS OHV Naturally Aspirated, 3.8L 3769CC 230Cu. L6 GAS SOHC Naturally Aspirated, 3.8L 3770CC 230Cu. L6 GAS L-HEAD Naturally Aspirated, 3.8L 3770CC 230Cu. L6 GAS SOHC Naturally Aspirated, 3.8L 3802CC 232Cu. L6 GAS OHV Naturally Aspirated, 3.8L 3852CC 235Cu. L6 GAS OHV Naturally Aspirated, 3.9L 235Cu. L6 GAS Naturally Aspirated, 3.9L 236Cu. L6 GAS Naturally Aspirated, 3.9L 240Cu. L6 GAS Naturally Aspirated, 3.9L 3878CC l6 GAS Naturally Aspirated, 3.9L 3924CC 239Cu. V8 GAS L-HEAD Naturally Aspirated, 3.9L 3933CC 240Cu. L6 GAS OHV Naturally Aspirated, 4.0L 242Cu. L6 GAS OHV Naturally Aspirated, 4.0L 3956CC l6 GAS OHV Naturally Aspirated, 4.1L 250Cu. V8 GAS OHV Naturally Aspirated, 4.1L 4098CC 250Cu. L6 GAS OHV Naturally Aspirated, 4.1L 4098CC 250Cu. L6 GAS SOHC Naturally Aspirated, 4.1L 4114CC 251Cu. L6 GAS L-HEAD Naturally Aspirated, 4.2L 255Cu. V8 GAS OHV Naturally Aspirated, 4.2L 258Cu. L6 GAS Naturally Aspirated, 4.2L 258Cu. L6 GAS OHV Naturally Aspirated, 4.2L 4227CC l6 GAS OHV Naturally Aspirated, 4.2L 4228CC 258Cu. L6 GAS OHV Naturally Aspirated, 4.2L 4229CC 258Cu. L6 GAS OHV Naturally Aspirated, 4.3L 260Cu. V8 GAS Naturally Aspirated, 4.3L 265Cu. V8 GAS Naturally Aspirated, 4.3L 4261CC 260Cu. V8 GAS OHV Naturally Aspirated, 4.3L 4278CC 261Cu. L6 GAS OHV Naturally Aspirated, 4.3L 4294CC 262Cu. L6 GAS OHV Naturally Aspirated, 4.3L 4311CC 263Cu. L8 GAS OHV Naturally Aspirated, 4.3L 4327CC 264Cu. V8 GAS OHV Naturally Aspirated, 4.3L 4343CC 265Cu. V8 GAS OHV Naturally Aspirated, 4.3L 4360CC 266Cu. V8 GAS OHV Naturally Aspirated, 4.4L 266Cu. V8 GAS Naturally Aspirated, 4.4L 270Cu. V8 GAS Naturally Aspirated, 4.4L 4425CC 270Cu. L6 GAS OHV Naturally Aspirated, 4.4L 4425CC 270Cu. V8 GAS OHV Naturally Aspirated, 4.4L 4458CC 272Cu. V8 GAS OHV Naturally Aspirated, 4.5L 272Cu. V8 GAS Naturally Aspirated, 4.5L 273Cu. V8 GAS Naturally Aspirated, 4.5L 276Cu. V8 GAS Naturally Aspirated, 4.5L 4473CC 273Cu. V8 GAS OHV Naturally Aspirated, 4.5L 4540CC 277Cu. V8 GAS OHV Naturally Aspirated, 4.6L 283Cu. V8 GAS Naturally Aspirated, 4.6L 4622CC 282Cu. L6 GAS OHV Naturally Aspirated, 4.6L 4638CC 283Cu. V8 GAS OHV Naturally Aspirated, 4.7L 287Cu. V8 GAS Naturally Aspirated, 4.7L 289Cu. V8 GAS Naturally Aspirated, 4.7L 4703CC 287Cu. V8 GAS OHV Naturally Aspirated, 4.7L 4707CC 287Cu. V8 GAS OHV Naturally Aspirated, 4.7L 4720CC 288Cu. V8 GAS OHV Naturally Aspirated, 4.7L 4727CC 289Cu. V8 GAS OHV Naturally Aspirated, 4.7L 4753CC 290Cu. V8 GAS OHV Naturally Aspirated, 4.8L 290Cu. V8 GAS Naturally Aspirated, 4.8L 292Cu. L6 GAS Naturally Aspirated, 4.8L 292Cu. L6 LPG Naturally Aspirated, 4.8L 292Cu. V8 GAS Naturally Aspirated, 4.8L 4786CC 292Cu. L6 GAS OHV Naturally Aspirated, 4.8L 4786CC 292Cu. V8 GAS OHV Naturally Aspirated, 4.8L 4801CC 292Cu. L6 GAS OHV Naturally Aspirated, 4.8L 4801CC 292Cu. L6 LPG OHV Naturally Aspirated, 4.9L 299Cu. V8 GAS Naturally Aspirated, 4.9L 300Cu. V8 GAS Naturally Aspirated, 4.9L 4917CC 300Cu. L6 GAS OHV Naturally Aspirated, 4.9L 4917CC 300Cu. L6 LPG OHV Naturally Aspirated, 4.9L 4917CC 300Cu. V8 GAS OHV Naturally Aspirated, 4.9L 4933CC 301Cu. V8 GAS OHV Naturally Aspirated, 4.9L 4949CC 302Cu. V8 GAS OHV Naturally Aspirated, 5.0L 302Cu. V8 GAS Naturally Aspirated, 5.0L 302Cu. V8 GAS OHV Naturally Aspirated, 5.0L 304Cu. V8 GAS Naturally Aspirated, 5.0L 304Cu. V8 LPG Naturally Aspirated, 5.0L 305Cu. V6 GAS Naturally Aspirated, 5.0L 305Cu. V8 GAS OHV Naturally Aspirated, 5.0L 307Cu. V8 GAS Naturally Aspirated, 5.0L 4949CC 302Cu. V8 GAS OHV Naturally Aspirated, 5.0L 4950CC 302Cu. V8 GAS OHV Naturally Aspirated, 5.0L 4966CC 303Cu. V8 GAS OHV Naturally Aspirated, 5.0L 4982CC 304Cu. V8 GAS OHV Naturally Aspirated, 5.3L 5272CC 322Cu. V8 GAS OHV Naturally Aspirated, 5.3L 5310CC 324Cu. V8 GAS OHV Naturally Aspirated, 5.3L 5327CC 325Cu. V8 GAS OHV Naturally Aspirated, 5.3L 5343CC 326Cu. V8 GAS OHV Naturally Aspirated, 5.3L 5358CC 327Cu. V8 GAS OHV Naturally Aspirated, 5.4L 327Cu. V8 GAS Naturally Aspirated, 5.4L 330Cu. V8 GAS Naturally Aspirated, 5.4L 331Cu. V8 GAS Naturally Aspirated, 5.4L 5409CC 330Cu. V8 GAS OHV Naturally Aspirated, 5.4L 5425CC 331Cu. V8 GAS OHV Naturally Aspirated, 5.4L 5441CC 332Cu. V8 GAS OHV Naturally Aspirated, 5.5L 5522CC 337Cu. V8 GAS OHV Naturally Aspirated, 5.6L 340Cu. V8 GAS Naturally Aspirated, 5.6L 343Cu. V8 GAS Naturally Aspirated, 5.6L 345Cu. V8 GAS OHV Naturally Aspirated, 5.6L 5572CC 340Cu. V8 GAS OHV Naturally Aspirated, 5.6L 5573CC 340Cu. V8 GAS OHV Naturally Aspirated, 5.6L 5585CC 343Cu. V8 GAS OHV Naturally Aspirated, 5.6L 5654CC 345Cu. V8 LPG OHV Naturally Aspirated, 5.7L 345Cu. V8 GAS Naturally Aspirated, 5.7L 347Cu. V8 GAS Naturally Aspirated, 5.7L 348Cu. V8 GAS Naturally Aspirated, 5.7L 350Cu. V8 GAS OHV Naturally Aspirated, 5.7L 350Cu. V8 LPG Naturally Aspirated, 5.7L 5687CC 347Cu. V8 GAS OHV Naturally Aspirated, 5.7L 5704CC 348Cu. V8 GAS OHV Naturally Aspirated, 5.7L 5733CC 350Cu. V8 GAS OHV Naturally Aspirated, 5.7L 5736CC 350Cu. V8 LPG OHV Naturally Aspirated, 5.7L 5737CC 350Cu. V8 GAS OHV Naturally Aspirated, 5.7L 5753CC 351Cu. V6 GAS OHV Naturally Aspirated, 5.8L 351Cu. V8 GAS Naturally Aspirated, 5.8L 351Cu. V8 GAS OHV Naturally Aspirated, 5.8L 352Cu. V8 GAS Naturally Aspirated, 5.8L 354Cu. V8 GAS Naturally Aspirated, 5.8L 5752CC 351Cu. V8 GAS OHV Naturally Aspirated, 5.8L 5753CC 351Cu. V8 GAS OHV Naturally Aspirated, 5.8L 5769CC 352Cu. V8 GAS OHV Naturally Aspirated, 5.9L 5900CC 360Cu. V8 GAS OHV Naturally Aspirated, 5.9L 5917CC 361Cu. V8 GAS OHV Naturally Aspirated, 6.0L 5967CC 364Cu. V8 GAS OHV Naturally Aspirated, 6.0L 5972CC 365Cu. V8 GAS OHV Naturally Aspirated, 6.1L 6064CC 370Cu. V8 GAS OHV Naturally Aspirated, 6.1L 6081CC 371Cu. V8 GAS OHV Naturally Aspirated, 6.3L 383Cu. V8 GAS Naturally Aspirated, 6.3L 6274CC 383Cu. V8 GAS OHV Naturally Aspirated, 6.3L 6277CC 383Cu. V8 GAS OHV Naturally Aspirated, 6.3L 6286CC 383Cu. V8 GAS OHV Naturally Aspirated, 6.4L 389Cu. V8 GAS Naturally Aspirated, 6.4L 390Cu. V8 GAS OHV Naturally Aspirated, 6.4L 392Cu. V8 GAS Naturally Aspirated, 6.4L 392Cu. V8 GAS OHV Naturally Aspirated, 6.4L 6376CC 389Cu. V8 GAS OHV Naturally Aspirated, 6.4L 6391CC 390Cu. V8 GAS OHV Naturally Aspirated, 6.4L 6392CC 390Cu. V8 GAS OHV Naturally Aspirated, 6.4L 6424CC 392Cu. V8 GAS OHV Naturally Aspirated, 6.4L 6425CC 392Cu. V8 GAS OHV Naturally Aspirated, 6.5L 394Cu. V8 GAS Naturally Aspirated, 6.5L 396Cu. V8 GAS Naturally Aspirated, 6.5L 6458CC 394Cu. V8 GAS OHV Naturally Aspirated, 6.5L 6489CC 396Cu. V8 GAS OHV Naturally Aspirated, 6.6L 400Cu. V8 GAS Naturally Aspirated, 6.6L 400Cu. V8 GAS OHV Naturally Aspirated, 6.6L 401Cu. V8 GAS Naturally Aspirated, 6.6L 401Cu. V8 GAS OHV Naturally Aspirated, 6.6L 402Cu. V8 GAS Naturally Aspirated, 6.6L 402Cu. V8 GAS OHV Naturally Aspirated, 6.6L 6555CC 400Cu. V8 GAS OHV Naturally Aspirated, 6.6L 6556CC 400Cu. V8 GAS OHV Naturally Aspirated, 6.6L 6571CC 401Cu. V8 GAS OHV Naturally Aspirated, 6.6L 6572CC 401Cu. V8 GAS OHV Naturally Aspirated, 6.6L 6588CC 402Cu. V8 GAS OHV Naturally Aspirated, 6.6L 6654CC 406Cu. V8 GAS OHV Naturally Aspirated, 6.7L 406Cu. V8 GAS Naturally Aspirated, 6.7L 409Cu. V8 GAS Naturally Aspirated, 6.7L 410Cu. V8 GAS Naturally Aspirated, 6.7L 6704CC 409Cu. V8 GAS OHV Naturally Aspirated, 6.7L 6720CC 410Cu. V8 GAS OHV Naturally Aspirated, 6.7L 6769CC 413Cu. V8 GAS OHV Naturally Aspirated, 6.8L 413Cu. V8 GAS Naturally Aspirated, 6.9L 6900CC 421Cu. V8 GAS OHV Naturally Aspirated, 7.0L 425Cu. V8 GAS Naturally Aspirated, 7.0L 426Cu. V8 GAS Naturally Aspirated, 7.0L 427Cu. V8 GAS Naturally Aspirated, 7.0L 428Cu. V8 GAS Naturally Aspirated, 7.0L 429Cu. V8 GAS Naturally Aspirated, 7.0L 430Cu. V8 GAS Naturally Aspirated, 7.0L 6966CC 425Cu. V8 GAS OHV Naturally Aspirated, 7.0L 6981CC 426Cu. V8 GAS OHV Naturally Aspirated, 7.0L 6997CC 427Cu. V8 GAS OHV Naturally Aspirated, 7.0L 6998CC 427Cu. V8 GAS OHV Naturally Aspirated, 7.0L 7014CC 428Cu. V8 GAS OHV Naturally Aspirated, 7.0L 7030CC 429Cu. V8 GAS OHV Naturally Aspirated, 7.0L 7031CC 429Cu. V8 GAS OHV Naturally Aspirated, 7.0L 7047CC 430Cu. V8 GAS OHV Naturally Aspirated, 7.0L 7048CC 430Cu. V8 GAS OHV Naturally Aspirated, 7.2L 440Cu. V8 GAS Naturally Aspirated, 7.2L 440Cu. V8 GAS OHV Naturally Aspirated, 7.2L 7211CC 440Cu. V8 GAS OHV Naturally Aspirated, 7.2L 7212CC 440Cu. V8 GAS OHV Naturally Aspirated, 7.4L 454Cu. V8 GAS Naturally Aspirated, 7.4L 454Cu. V8 GAS OHV Naturally Aspirated, 7.4L 7439CC 454Cu. V8 GAS OHV Naturally Aspirated, 7.4L 7441CC 454Cu. V8 GAS OHV Naturally Aspirated, 7.5L 455Cu. V8 GAS Naturally Aspirated, 7.5L 460Cu. V8 GAS OHV Naturally Aspirated, 7.5L 7456CC 455Cu. V8 GAS OHV Naturally Aspirated, 7.5L 7457CC 455Cu. V8 GAS OHV Naturally Aspirated, 7.5L 7539CC 460Cu. V8 GAS OHV Naturally Aspirated, 7.6L 462Cu. V8 GAS Naturally Aspirated, 7.6L 7582CC 462Cu. V8 GAS OHV Naturally Aspirated, 7.7L 472Cu. V8 GAS Naturally Aspirated, 7.7L 7735CC 472Cu. V8 GAS OHV Naturally Aspirated, 8.2L 500Cu. V8 GAS Naturally Aspirated, 8.2L 8193CC 500Cu. V8 GAS OHV Naturally Aspirated, 8.2L 8195CC 500Cu. V8 GAS OHV Naturally Aspirated. This part fits vehicles made in the following years 1953, 1954, 1955, 1956, 1957, 1958, 1959, 1960, 1961, 1962, 1963, 1964, 1965, 1966, 1967, 1968, 1969, 1970, 1971, 1972, 1973, 1974, 1975, 1976, 1977, 1978, 1979, 1980, 1981, 1982, 1983, 1984, 1985, 1986, 1987, 1988, 1989, 1990, 1991, 1992, 1993, 1994, 1995. This item may interchange to the following part numbers from other brands. SYSTEMS, AUTOZONE/MALLORY, AUTOZONE/MOTORCRAFT, AUTOZONE/MSD, CARQUEST RED/WELLS, CARQUEST/WELLS, MALLORY, MIGHTY, MOTORCRAFT, MSD IGNIT. ORIGINAL ENGINE MANAGEMENT, STANDARD MOTOR PRODUCTS, STANDARD TRU-TECH, WELLS Part Numbers: 26189, 29440, 29450, 5-500, 5025, 5029, 5185, 5195, 52-1904, 5C1026, 7B6, 8203, C819, DGC-13, FD-471, UC-12T, UC-16. OEM Part Haus has been in business since 2006. We specialize in providing original equipment parts for guaranteed fitment and application accuracy. No painted junkyard parts or inferior knock-offs. We also provide accessories and performance upgrades. We're enthusiasts just like you! It is our goal to help you keep your European car on the road and performing at the high level that it should! We're also active in several automotive communities, including: BMW Car Club of America, Porsche Club of America and Merkur Club of America. Due to our automated ordering program, orders that have been placed CAN NOT be cancelled. The only reason an order will be cancelled is if the item is out of stock or damaged. It is highly recommended that buyers be 100% sure they need the item and consult the compatibility chart, if needed. Portions of the part information on this page have been provided by WHI Solutions, Inc. The item "Ignition Coil-Super Coil ACCEL 140001" is in sale since Wednesday, August 23, 2017. This item is in the category "eBay Motors\Parts & Accessories\Car & Truck Parts\Ignition Systems\Coils, Modules & Pick-Ups". The seller is "oemparthaus2" and is located in Dallas, Texas. This item can be shipped to United States, Canada, United Kingdom, Denmark, Romania, Slovakia, Bulgaria, Czech republic, Finland, Hungary, Latvia, Lithuania, Malta, Estonia, Australia, Greece, Portugal, Cyprus, Slovenia, Japan, Sweden, South Korea, Indonesia, Taiwan, South africa, Thailand, Belgium, France, Hong Kong, Ireland, Netherlands, Poland, Spain, Italy, Germany, Austria, Russian federation, Israel, Mexico, New Zealand, Philippines, Singapore, Switzerland, Norway, Saudi arabia, Ukraine, United arab emirates, Qatar, Kuwait, Bahrain, Croatia, Malaysia, Brazil, Chile, Colombia, Costa rica, Dominican republic, Panama, Trinidad and tobago, Guatemala, El salvador, Honduras, Jamaica.